1. Preheat the oven to 200°C, gas mark 6. Toss the butternut cubes in a large bowl with the fajita seasoning, garlic oil and chillies. Tip into a non-stick baking tray and bake for 30 minutes, until tender and golden. 2. Heat the rice according to the pack instructions. Finely chop the coriander stems and set aside, then finely chop the leaves. Stir the black beans, cumin, two-thirds of the lime juice and the coriander stems into the rice, then season. 3. Mix the yoghurt with the coriander leaves and remaining lime juice, then season. 4. Warm the wraps according to the pack instructions. 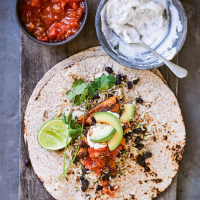 Serve each wrap filled and rolled with the rice, squash, a drizzle of coconut yoghurt and any extras such as avocado, salsa or chilli sauce.